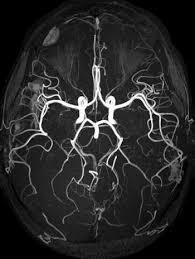 Magnetic Resonance Angiography (MRA) is an MRI of the blood vessels often performed with contrast material (gadolinium). Gadolinium is injected intravenously and leaves the body naturally. Magnetic Resonance Angiography is a noninvasive exam which allows for the evaluation of blood vessels in the body; inclusive of the head, neck, abdomen, chest, and kidneys. Magnetic Resonance Angiography (MRA) is performed to diagnose such conditions as aneurysms, clots, narrowing of the arteries, heart disease, calcium deposits and stroke. As with all MRI’s, to be sure the exam will be a safe one, patients should inform the technologist of their medical history such as if they have any metal clips or pins in their body, joint replacement, cosmetic metal implants i.e., cochlear (ear) implants, or a heart pacemaker. Patients will be asked to lie still during the exam to avoid any blurriness on the images. Results of your exam are faxed to your doctor within 24 hours and we will contact your doctor immediately to discuss any abnormal results.